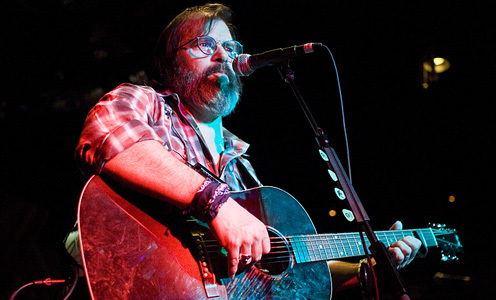 According to the Austin grapevine, Steve Earle flew in strictly for the single solo show he did at The Parish Room Friday evening before heading back to NYC to continue working on his upcoming album. Thank you, Steve Earle. Towards the end of Earle’s set, his wife, musician Alison Moorer, joined him on stage to duet “Comin’ Around,” which was originally recorded with Emmylou Harris in 2004. Afterwards Earle broke into a rousing acoustic rendition of “Copperhead Road;” alas, no one missed the bagpipe intro. All in all, Earle’s set was a definite 2007 SXSW highlight. Below: Here is one of my favorite Earle love songs, “I Thought You Should Know,” off, ironically, one of my least favorite Earle LPs; 2004’s The Revolution Starts…Now. Photo credit: Chromewaves. Taken Friday evening, between 11-12 pm, stage left. You lucky sonuvagun. Sounds like a hell of a show. I saw Steve Earle live once. I was a big fan prior to the show, but his personality was so unpleasant that I have trouble listening to his music now. He was arrogant and mean-spirited. I agree with probably 90 percent of his political positions as such, but his manner and logic were just simple-minded and nasty. golly, his beard is bushy!